Is China really killing Taiwan’s tourism industry? The simple truth is that far from “dwindling,” in July slightly more tourists from China had arrived in Taiwan for the first seven months of 2016 than for the same period in 2015 (the number of Chinese tourists actually rose from June to July). Not until August did Chinese tourism numbers finally dip below their 2015 levels, because of the group tourist cuts. Firms catering to such tourists were hard hit. Everyone else, however, was delighted: Chinese tourist groups are the most widely despised tourists on the island, widely seen as the least remunerative and the most obnoxious. Taiwan Thinktank, a pro-Taiwan organization, polled the public on Chinese tourism in October, finding that given a choice, 85 percent wanted to increase tourists from other countries, while just 6 percent wanted to increase tourists from China. Strangely oblivious to the “suffering” the international media had assured us was serious, Taiwanese increased the number of industry accommodations, rooms, and employees in 2016. According to the Tourism Bureau, in November of 2015 Taiwan boasted 2,993 hotels offering 137,405 rooms staffed by 51,261 employees. In November of 2016 these numbers stood at 3,134, 147,143, and 54,790, respectively. Similarly, in November of 2015 Taiwan had 5,999 homestay establishments with 24,230 rooms, while in November of 2016 it had 6,986 such establishments with 28,239 rooms. Truly the industry’s pain must have been horrible. There was “suffering,” but it was quite limited. As China slashed group tourists, a small group of hotels, bus companies, and other firms who had invested heavily in the group tourist trade began screaming loudly. This continued investment in tourists easily controlled by Beijing is somewhat puzzling, since everyone in Taiwan had known since the November 2014 elections that the pro-Taiwan party, the Democratic Progressive Party (DPP), would win the presidency in 2016. Indeed, tourism association officials began warning that Taiwan could lose Chinese tourists during the election campaign in late 2015. These firms thus chose to bet on an entirely artificial market created by political subsidies, which Beijing could extinguish at whim. Hence the “protests” from these firms that took place this fall (widely reported in the foreign media, of course) give every appearance of cynical calculation: either they would continue to receive flows of tourists from China, or, if cut off, they would receive subsidies from the government if they screamed loud enough (as they actually did). Moreover, as has been reported in the English and local language media, tourist companies from China are slow to pay, or do not pay their debts as all. 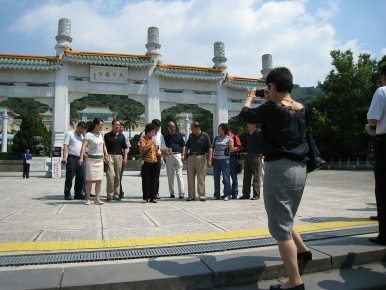 The tour group cuts thus triggered a wave of bankruptcies in Taiwan. Relative to Taiwan’s $530 billion economy, the actual loss from Chinese group tours is tiny. Even that may well be offset by the effects of Chinese tourism on the NT dollar: as Chinese tourists arrive in Taiwan they purchase NT dollars, driving up the value of the NT, reducing Taiwan’s ability to export its flagship electronics goods. It also diverts precious investment funds to an industry Beijing can harm any time. Nor is the negative impact of China group tourism limited to its largely illusory economic benefits. Scholar Ian Rowen has documented how group tourism is a territorial expansion strategy of China and how local tourists avoid sites frequented by Chinese tourists. The constant use of terms like “lucrative” or “suffering” to describe the effects of Chinese tourism in Taiwan highlights their key political role: Chinese tourists are aimed squarely at local Taiwan politics and at the international media. By sending in flows of tourists Beijing builds local patronage networks. They also offer Beijing a way to generate and then manage foreign media reporting through “goodwill” or “tensions” as needed, which costs Beijing nothing (outbound tourism is an import and cutting it helps Beijing’s trade numbers) yet has little real effect on Taiwan. When cut off, its patrons in Taiwan can be expected to scream loudly, and be heard in the dutifully unskeptical international media. Beijing’s tourism taps may not be an economic success, but they make effective political theater. Gone from the narrative: the loss of Chinese group tourists was offset by rises in more lucrative tourists from elsewhere. In 2016, Taiwan will likely set a record for overall tourist arrivals. Probably won’t see that in the paper anytime soon, though. For Beijing, Chinese tourists are a simple yet powerful foreign policy tool.